Xunantunich Guided Tour - "Our Belize Vacation"
The site of Xunantunich (Maiden of the Rock) is just northeast of Benque Viejo, near the confluence of the Mopan and Belize rivers. 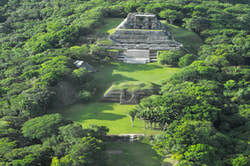 The ruins of Xunantunich comprise the largest archaeological site in the Belize River Valley. Indications from pottery and from stelae inscribed with date glyphs are that Xunantunich was occupied until about 850 A.D., somewhat later than other sites of the Classic period. The eminently defensible situation of the ceremonial center, with its commanding view of the surrounding countryside, might have had something to d with this relative longevity. Though known to archaeologists since the late nineteenth century, Xunantunich was not excavated until 1959 and 1960, and started the work of stablizing the structures. More recent excavations took place after looting. Only limited restoration and reconstruction has been done. Bring a snack and something to drink, as there are no facilities for visitors. In contrast to remote Caracol, Xunantunich (the Maya "x" is pronounced like a cross between an English "she" and "z") is one of the most accessible ancient Maya sites in Belize. The ruins are near the confluence of the Belize and Mopan rivers, on a naturally occurring limestone bluff above the Western Highway, about 7 miles west of San Ignacio. This is a Late Classic period ceremonial center of impressive height but relatively small size. It is just across the Mopan River from the Maya village of San Jose Succotz and only a few miles east of the Guatemalan border. The temple complex, occupied from about A.D. 700 until at least A.D. 1,000, is surrounded by forest that is gradually being whittled away by local farmers. Because of its commanding presence and proximity to populated areas, Xunantunich has been visited by a lengthy parade of archaeologists stretching back to 1894. In 1959, experts speculated that the site had been partially destroyed in an earthquake during the Late Classic era and reasoned that this incident may have shaken the faith the Maya had in their leaders, who claimed an intimate relationship with the gods. In recent years, however, this theory has been discredited by some archaeologists. Dominating the topography of Xunantunich ("maiden of the rock") is a spectacular 135-foot monolith known as El Castillo (The Castle). In typical Maya fashion, the corbel-vaulted temple at the summit is actually built on the rubble of several earlier temples constructed one atop the other over the centuries. Visitors can climb nearly to the top of this impressive tower, which affords a sweeping view of the steamy forest and overlooks the three adjacent plazas and carious corbel-arched buildings that surrounded them. Visible on the east side of El Castillo's lower temple is a stucco frieze, restored in 1972 and again in 1998, showing symbols of the sun, moon, Venus, and days of the week. Also included is a headless man, apparently decapitated for some long forgotten transgression against the royal rulers. Originally the frieze continued all the way around the structure, and its highest point was probably topped by a roof comb. An excavated stairway continues to a small chamber in the upper temple of El Castillo. Near the structure's base is a wide terrace that once supported several smaller temples. The grass-covered mounds surrounding the three primary plazas are the remains of ancient residential buildings. On the west side, near the restrooms, is a flat, narrow rectangle believed to be a ball court, used in a deadly form of soccer developed by the Maya hierarchy. Also visible is a room with a built-in stone bench and some walls bearing ancient Maya graffiti. Judging from the jewelry, tools, semiprecious stones, and weaving materials found here, archaeologists believe Xunantunich was once an important and well-ordered city. No one is sure why this site was abandoned, or why it flourished so late in the Maya epoch. The University of California - Los Angles and University of Pennsylvania were recently is involved in an eight year field study here. On the west side of El Castillo, the team uncovered a spectacular plaster frieze. Thirty feel long, the frieze was made between A.D. 800 and 900, a time when most other Maya cities were collapsing. Archaeologists are also uncovering small home sites and farms along the length of a sacbe, a very old Maya road.